Sift both kind of flour with baking powder, sugar and salt. Whisk butter with eggs and milk. Mix togeter liquid and dry mixture and finally add marrons glacés (whole or in pieces, it’s up to you). 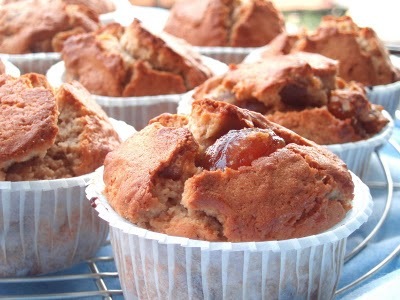 Spoon the mixture into a greased muffin tin (or with paper cups) and bake at 180° C (350F – gas mark 4) for about 25 minutes.